The Gobi Desert in Mongolia is a great winter destination for experiential travel, offering stunning landscapes and natural beauty, and unique opportunities to learn about an intriguing culture and the nomadic way of life practiced here for millennia. 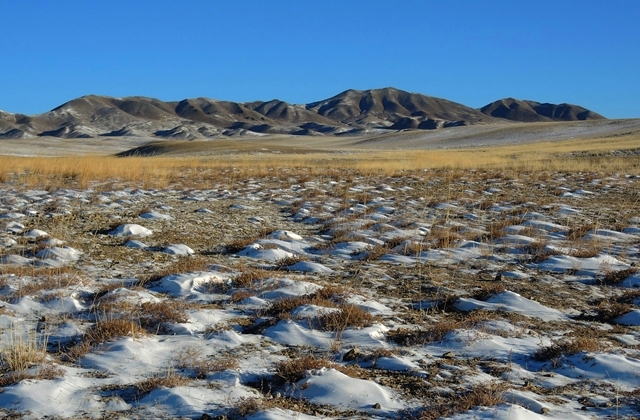 A winter tour in the Gobi Desert is for adventure travelers. While the Gobi is warmer than the Northern stretches of Mongolia, this is still the coldest desert on earth, and temperatures in the middle of winter are below freezing, and occasionally drop well below that. 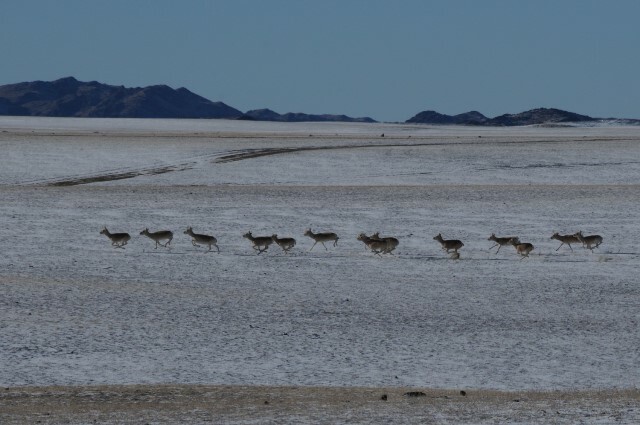 The cold season in the Gobi desert has much to offer though, and with a reliable jeep to travel in, a winter desert tour can be designed to be an unforgettable adventure with lasting memories. Staying overnight in a warm ger, the traditional felt tent of Mongolian nomadic livestock herders, or in family guest houses in settlements gives the winter traveler warmth not only from the stoves but from the genuine hospitality of the people of the Gobi. Local food is receiving more interest by adventure travelers all over the globe, and Mongolia has to offer very special and hearty cooking, traditionally based on meat and dairy. However, vegetarian and even vegan diets are accommodated, as Mongolian hosts adjust to travelers preferences and as “white food” as vegetarian meals are called in the country, is becoming popular among Mongolian people as well. As long as there is a water source, desert locations make for great cultivation of produce and the Gobi desert is no exception. Gobi tomatoes are known throughout the country, and vegetable production in the South Gobi is expanding with green houses and other appropriate technologies. During a homestay in the Gobi, you will enjoy locally grown and produced vegetables and preserves. Winter time is the traditional time for slaughtering animals though, for obvious reasons of hygiene and meat preservation in cold temperatures, and if you like meat you will enjoy great quality here – “grass fed” is normal throughout the country, and the Gobi pastures of sage and often with a predominance of wild leek plants make for real tasty meat. The leek is also collected by herders and made into a very tasty preserve that is used for seasoning in soups and with other dishes. Also, small cakes are produced from the plants that serve as livestock supplement or emergency fodder in the winter. A mild “vodka” distilled on the family stove from milk is another great traditional product; its alcohol content is less than that of real vodka, but it sure does warm you up. Dairy products are available year round and the range of products has grown from traditional curds dried in the sun on the roof of the ger to champagne and sweets made from milk. Herder women are experts in dairy production and have brought their products to international events of the “Slow Food” Movement – watch the Gobi desert as an emerging destination also for food tourism! 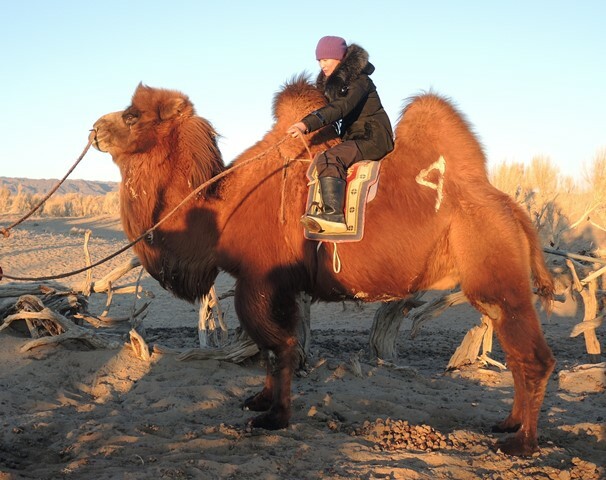 Very different, very special..
Activities on a Gobi winter tour are none less than during summer time, and some aspects are more inviting during the cold season. The camels are nice looking with their thick winter wool, and a winter camel ride is kind of cozy as you sit between the humps of the Bactrian camel that are thick with winter wool. A borrowed Deel, the traditional Mongolian coat, and felt lined winter boots will further help to make a winter camel ride a great experience. The desert landscapes are brilliant in winter. 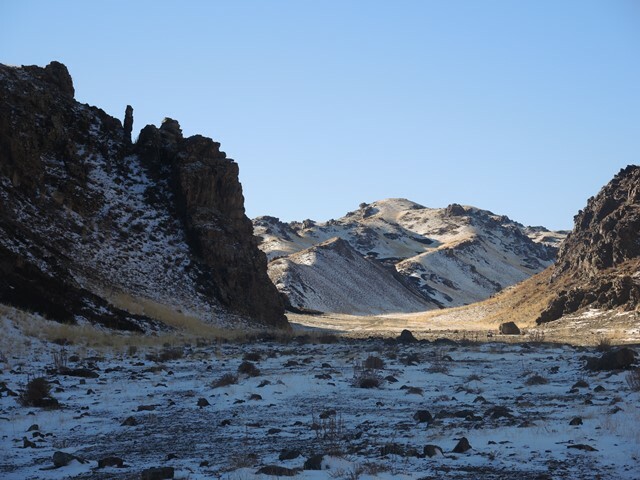 Water courses are frozen solid and glisten in the sun, making a stark contrast to towering rock cliffs; this is a typical feature of the winter Gobi. With some luck, you may see the tracks of a snow leopard in the snow along the cliffs or crossing the ice. The Gobi landscapes in Mongolia are diverse, far more than just sand dunes and winter light makes them stand out in special ways. The windblown patterns of rippled sand dunes with dustings of snow make for great works of art and photo opportunities. Looking South across the vast expanses of the winter desert. 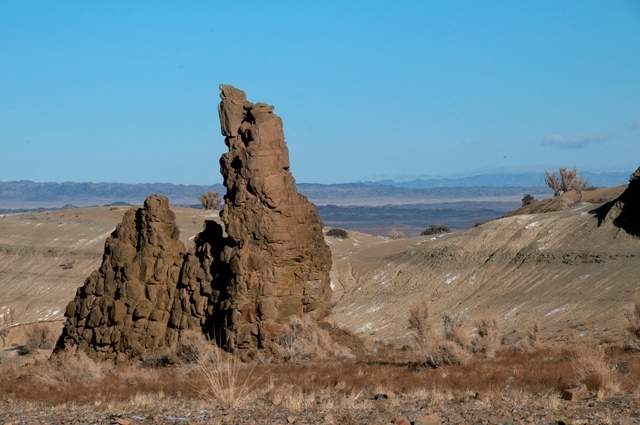 Open space and solitude..
its name – The “Three Beauties of the Gobi” , or “Gobi Gurvan Saikhan” National Park. The mountains rise to over 7000 feet above the grasslands of the desert steppe, and in winter the rugged peaks are often clad in snow. The vast plains, with herds of livestock or wild Mongolian gazelle, the mountain back drop and the clear blue winter sky are an impressive sight. Great views are to be had from even small peaks of the foothills. A hike up a valley and climb to a small peak offer both cultural and natural points of interest on the North side of the Western Beauty Mountains where the local community has erected a beautiful meditation retreat, statue and Buddhist temple as a place of worship and to honor the mountains and nature, the site is a focus of community activity. It’s an inspiring place to visit and to appreciate for its communal, spiritual and natural values. 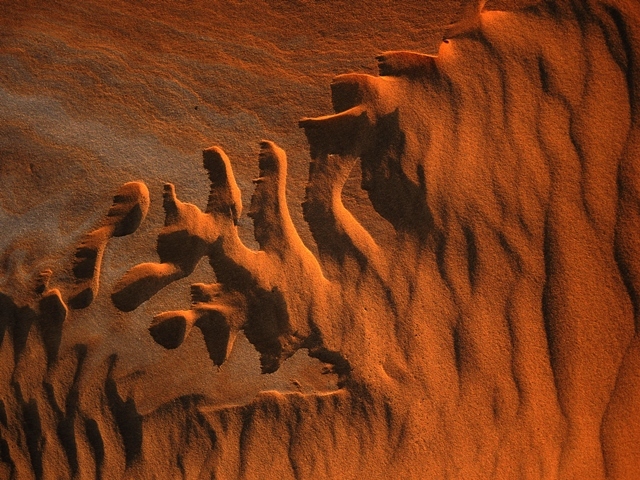 Nearby, as in various locations throughout the Gobi, petroglyphs can be found on a mountain side, a testimony to the long human history of these desert landscapes. 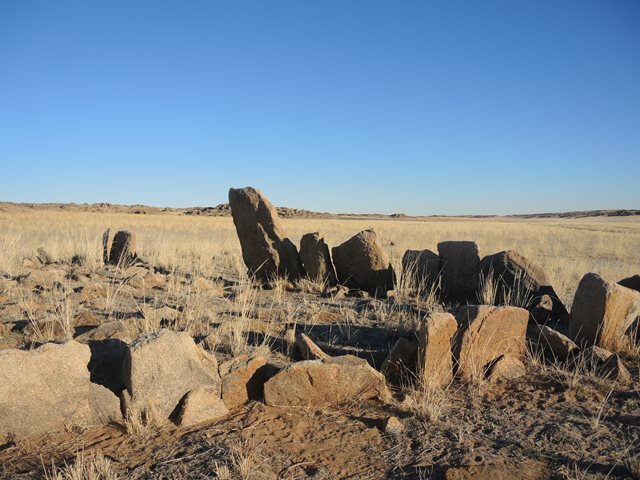 In another location, several hours South of the more traveled route in the South Gobi province, very interesting petroglyphs, some depicting horses, can be seen on boulders strewn on a mountain side. From here, a vast desert plain stretches all the way south to the border with China. Herders use this landscape, herding camel and small livestock. A stay with a camel herding family provides opportunity to learn about daily life and traditions, and to view the desert landscape from the top of a camel. The mountain ranges of the Three Beauties and other massifs rising from the desert, give ample opportunity to hike and explore, to follow tracks in deep gorges to ice falls blocking the way, to walk up canyons of red stone that lead like a staircase back up to the plains with sweeping views across the desert. The Gobi winter experience is made complete by local guides who not only show you the natural wonders of the desert, but make you feel at home introducing you to local herders, artists and spiritual leaders. The setting winter sun of the Gobi gives a white camel a warm glow. The camels are nice with thick wool in winter. 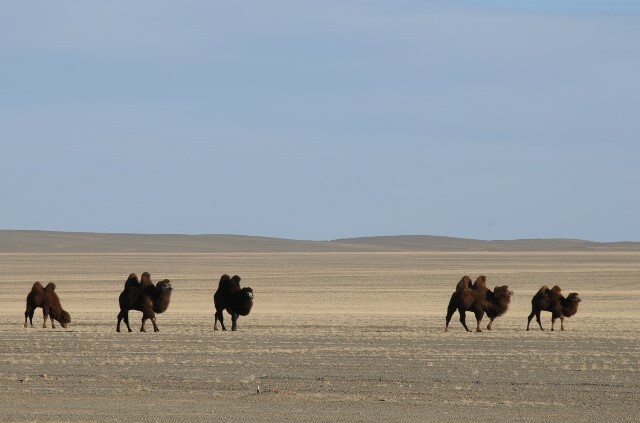 If you are looking for a winter destination, to get away from it all and spend your winter holiday in a very different place, think of the Gobi Desert in Mongolia! Contact us for more information and to discuss your Gobi Winter Adventure.